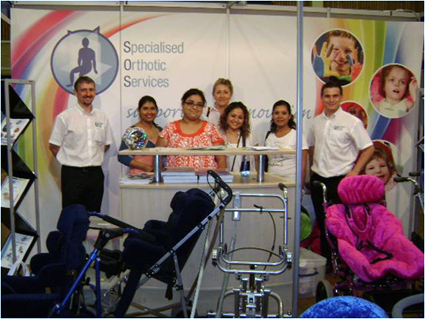 Specialised Orthotic Services, known as SOS, had some VIP visitors to its stand at Kidz South – members of MeDiCT (Mexican Disabled Children’s Trust), SOS’ nominated charity, and guests from Insituto Nuevo Amanecer (INA) a charitable institute in Mexico that MeDiCT supports where disabled children are treated and educated. The team from Mexico were in the UK for training and attended Kidz South to both meet the SOS team to thank them for their support as well as see the latest innovations available for disabled children. Gordon McQuilton, MD of SOS, and other SOS employees have visited Mexico over the last three years working with the UK-based charity MeDiCT which helps Mexican children with cerebral palsy. SOS’ support is two-fold. It appeals for wheelchairs and seating equipment which is no longer used and helps fund the shipment of a container to Mexico. In addition Gordon and his team also donate their time and expertise on an annual visit to Mexico to help assess the childrens’ complex seating needs and ensure the donated equipment benefits those needs. Visitors to SOS’ stand from INA included Nancy de la Rosa, head physiotherapist, Maritza Neri, head OT, Diana Rivas a speech and language therapist and Noelia Medellin, one of the teachers in the Institute. SOS showcased its popular ‘P’ Pod and ‘T’ Max on its stand. The ‘P’ Pod is a beanbag with a special seat attached which helps support a child or young adult in a beneficial seating position but offers the look of a regular piece of furniture found in most homes. The T Max is a moulded seat which helps children that cannot use conventional toilet equipment as well as being a showering aid. Clinic Manager Mark Henderson, VIP visitors from Mexico members of MeDiCT and Clinic Manager Mark Shaw.